The Sicilian Village Olives are by far, the most popular olive (and possibly product) we carry in our shop and in our gift baskets. Every time I serve them at a tasting I hear the exclamations, “Oh my goodness, these are amazing”, and they sell out. 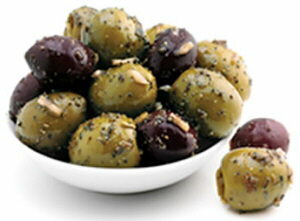 I have other good olives, but there is something special about these. “Nothing else comes close to the taste of a Sicilian olive. That’s because good things take time and, in today’s hurry-up-and-go world, most olive producers take shortcuts – like using chemicals to rush the curing process. Not at Sicilian Village. 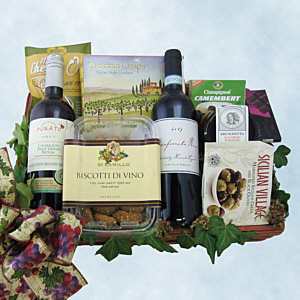 You will find Sicilian Village Olives not just in an Italian Gift Basket, but also in many of our Gourmet Gift Baskets, Wine Gift Baskets and, of course, on the shelves of our shop.